High economic policy uncertainty combined with rising interest rates and an economy performing above potential increase risks to equity investors - is this the session to sit out? A recent surf trip got me thinking about the marco economic climate and how to profit from it. Timing will make or break your surf session. To maximize the experience one has to time the tide, the wind, the swell, the crowds, and ultimately, the wave. Get it right and you will be buzzing for days; get it wrong and you are better off watching from the beach with a coffee. Macro economic investing is like that too. Time the economic cycle right and you can ride the wave to epic returns; time it wrong and get caught inside of bad trade. Blown out waves are waves which the wind renders un-surfable… or at least much less rewarding to surf due to shorter, choppier rides, and a lot of difficult paddling. If the wind is really strong, it is best to just have a coffee and watch the action from the beach. Have recent political events, including the movement towards trade wars by the US and the rise of populism in Europe, blown out investment opportunities? It is Vital Data Science Inc.’s view that recent events have increased the likelihood that equity markets are near a peak or are in the beginning stages of a correction. In this post we update readers on the macro economic climate and provide the results of quantitative modelling using our Bayesian Network model which provide probabilistic scenario forecasts. Based on those forecasts we describe our provide an update on our asset allocations. US - rising rates and policy uncertainty to ruin the session? Source: FRED, Vital Data Science Inc. The US economy has been expanding for a very long period, 34 quarters to be exact, in what has become one of the longest and most profitable recoveries in generations. We have now entered the final stretch: the economy is performing above its potential (chart 1) and monetary policy is tightening. As I have pointed out in previous analysis’, the period where the economy performs above its potential can persist for a relatively long time, however I do not believe that we are in a situation where this will be the case. While debt creation is under control (chart 2), debt levels remain near historical highs for consumers, business and government (chart 3) which decreases the capacity for further economic expansion and increases the sensitivity of each party to interest rates, which are increasing. Besides relatively high debt levels, the US economy is in good health: consumer sentiment and spending are high, U6 unemployment rate is at levels not seen since the last recession, and inflation is picking up. Most economic indicators indicate no immediate signs of recession. However tightening monetary policy and political uncertainty are beginning to creep into investors minds. I believe that this is presenting in two ways: 1) increased discount rates which are trimming equity returns despite strong earnings growth and a growing world economy; and 2) the collapsing of the spread between short and long term treasuries. In short, political uncertainty is blowing out an otherwise good investing session. The Chinese Communist Party continues to successfully execute the deleveraging. Debt continues to increase, however China analysts are beginning to forecast a decline of debt to GDP ratios starting later this year. Limiting of credit will negatively impact growth rates, however if the deleveraging is managed such that credit is limited to less productive businesses, the decrease in credit may be manageable. So far, so good. China will focus investment into these key sectors. While China has a long road ahead to dominance in sectors, China’s unique ability to coordinate laws, economic policy, social policy, and investment simultaneously, will allow the country to continue to make significant advances. An interesting element of this Made in China 2025 initiative is that it is not just inward facing: China will seek to, acquire foreign talent through acquisitions in these key sectors to build its own capabilities. The previous strategy was to attract foreign investment in the form of joint ventures, acquire knowhow in the process, and deploy and innovate internally. The change in strategy is significant because instead of leveraging its massive consumer market, China will instead leverage its also massive savings and continue to spread globally. There is no doubt that China acquiring the national champions in other regions will cause tensions with other world powers, China is an experienced global investor and will apply the lessons of previous successes and failures to maximize success and reduce tension. Further, Chinese capital and a long outlook on investment will continue to be welcome in regions with limited access to other forms capital and which may not fit the traditional targets of short term minded western investors. The Belt and Road initiative is further pushing China out into the global stage. Through this initiative, China makes investments in infrastructure to help link it to, as well as develop, new markets. So while other nations look inward, China is expanding its global reach. China is doing this by funding, through debt, infrastructure project in markets near the power to help facilitate business. This initiative not only increases trade and business through better infrastructure, it gives the Chinese leverage and influence in other regions through investment dollars. Thus far, the Chinese have been able to walk the tight rope of deleveraging their economy, increasing domestic demand, and investing for the future. While the future will surely have its share of challenges, the Chinese have proven to be excellent managing their economy. As Europe deleverages (chart 4) the economic zone was able to lock in solid GDP growth of almost 3% in the final two quarters of 2017. First quarter 2018 growth pulled back slightly to a still respectable 2.4% as the increasing value of the Euro cooled growth. More recently, turmoil in Italian politics caused investors concern of a possible Italian exist from the Euro. While the Italian situation did not turn into a crisis or Euro exit, political risks in the economic zone remaind, and it is having trouble generating steady and strong economic growth. Every time shoots of growth appear, political uncertainty - whether Brexit, Russia/US relations, or populist surges in the PIGS or Eastern countries - blow out the potential waves economic strength. In order to better understand the combined impact of the Fed Funds rate, GDP growth, and political uncertainty on equity prices, Vital Data Science Inc. developed a Bayesian Network model with with GDP gaps, monetary policy, treasury spreads, and economic policy uncertainty as factors, and SP500 performance as the response. 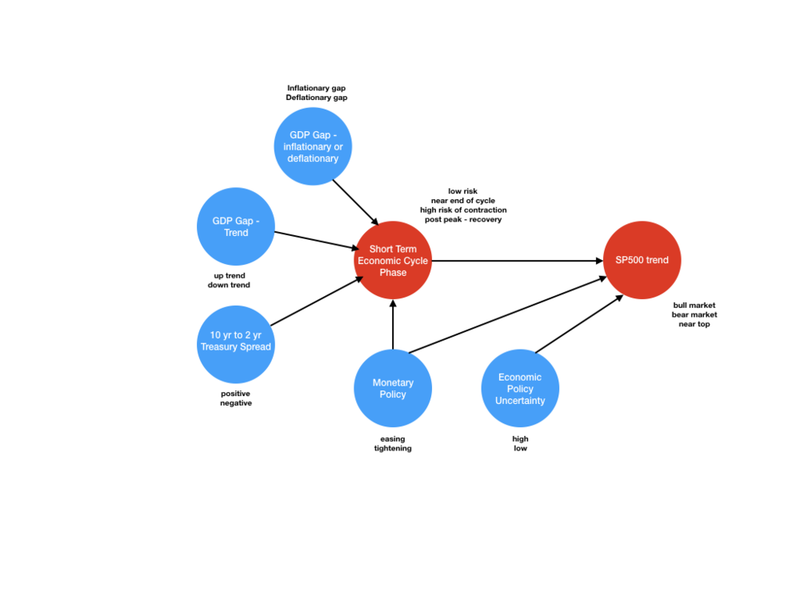 The model, which is depicted in Chart 6, shows parent nodes and their possible values in blue, and child nodes with possible values in red. Economic data was categorized from numerical economic data using a proprietary algorithm specifically designed for Bayesian Networks. The model was trained on data going back to 1950. Economic policy uncertainty values were sourced from policyunertainty.com, the remainder of the data from the Federal Reserve database. Source: Vital Data Science Inc.
Today’s factor categories are generally associated with a near peak of the short term economic cycle. This is when interest rates increase to stem inflation, ultimately causing the economy to contract. We are not at the contraction, but given how the economy is perform and tightening monetary policy, we are relatively close - another 34 quarters of growth highly unlikely! According to our model, a near peak of the short term economic cycle when combined with tightening monetary and high political uncertainty is associated, 50% of the time, with a bear market. Put in a different way, Vital Data Science Inc.’s model forecasts a 50% chance that the market does not regain the highs reached at the beginning of 2018 before entering the next recession - equity markets may have already entered the early stages of a bear market. It is important to note that the model also forecasts a 50% chance that the bull market will continue. To provide perspective of the result, during the early stages of the short term economic cycle, depending on monetary policy and economic policy uncertainty, our model predicts a 70% to 80% chance of being in a bull market. The shift down to a 50% chance of the bull market continuing is significant. Under similar circumstance, except when political uncertainty is assumed to be low, the model predicts a 20% chance of being near the end of the bull market (i.e. the previous peak may be topped, but we are within 9 months of entering a bear market) and a 25% chance that the have already entered a bear market. In this scenario, there is a 55% chance that the bull market continues. Historically, periods where the economy performs above its potential for a long period coincide with low levels of political uncertainty, which gives investors more time to ride the wave of high equity returns for longer. Currently, the opportunities are being blown out by political uncertainty. Given that generally there is a high probability of being in a bull market (usually ~80%), probabilities near 50% indicate that we have entered a risky period for equity markets. While Vital Data Science is not short equities, we have reduced equity positions in favour of holding a high proportion of gold and cash. To tie back to the surfing analogy: Vital Data Science has decided to sit this session out and enjoy a coffee from the beach. The US economy has de-levered and GDP growth is picking up. After years of crisis, the European economy is also hitting its stride. And despite high debt levels and the regulatory storm, even worries about China’s debt have eased for the time being. So, despite high valuations, risky assets continue to provide gracious returns. When will the good times end? How will we know they are ending? And how to take advantage? In this post I give my view. Consumers and businesses in the world’s largest economy have de-levered to pre-great recession levels. Meanwhile, the US government has levered up to post World War 2 levels. Households, businesses, and government are all increasing debt and income at the same rate (Figure 1). No imminent debt bubbles are forming. As US government debt has offset consumer and business deleveraging, total debt to GDP levels remain at historical highs (Figure 2). The US governments has more options for dealing with debt than business or consumers, therefore, while not inconsequential, the chances of US government debt creating an imminent crisis are low. Meanwhile, consumers and business are free to use their cleaner balance sheets to spend and invest which should grow the economy. Interest rates are likely to remain below those considered normal for the foreseeable future given government debt loads. Combine all of this and you have an economy that is finally performing above its potential (Figure 3), but is not over heating - the Goldilocks economy. U6 unemployment rate is nearing 2007 levels, leading indicators and consumer sentiment are high, capacity utilization has stabilized (Figure 4). Increasing inflation is coming. The last time debt/income levels of consumers and business were at these levels interest rates were near 5%, so all things being equal, the Fed has room to play with. However, all things are not equal. The economy is more fragile than debt to income values indicate. Low labour force participation rate and a lagging real median US income are signs the recovery mainly benefited wealthier citizens at the expense of middle America. Wealthier citizens do not consume their wage gains - they invest them. With no meaningful wage gains, large consumer spending will drive debt creation and be sensitive to interest rates. Another headwind in the American economy is demographics. The US population is increasing at the lowest level since WWII. Population growth will be a lower contributor to GDP than in previous generations and US business will need to look outwards to grow. Expanding abroad will be challenging in today’s global political climate. With growth being challenged domestically and offshore, the waves of consolidation in many industries will continue as companies use scale to squash competition, lower costs, and control pricing. Europe has followed a similar trajectory to the US, but is a couple of years behind. The time delay is the result of: a) American Fed’s robust response compared with the ECB’s initial tepid response to the financial crisis, and b) the challenge of coordinating the actions of different governments and cultures post crisis. 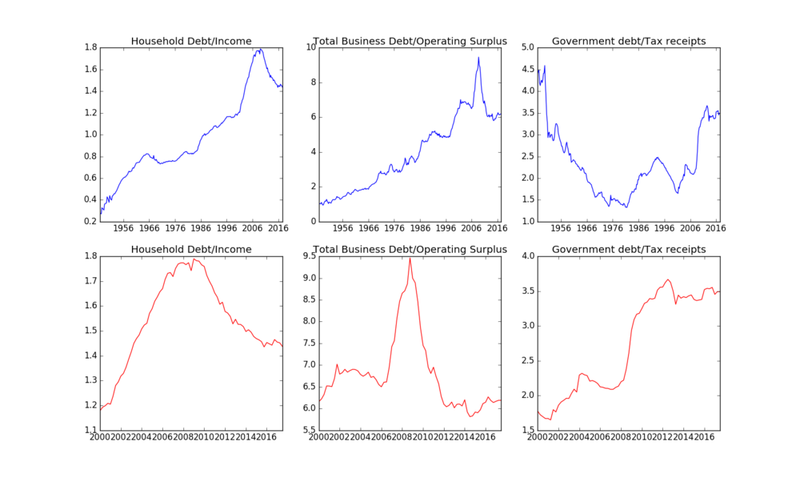 Outside of the time delay, the debt to income dynamics are similar: consumers and business have de-leveraged, governments have increased debt burdens (Figure 5). European GDP is rising, helped by loose monetary policies which decreased the value to the Euro and resulted in a stronger trade balance (Figure 6). In the near term, Europe’s headwinds are mainly geopolitical: the rise of populism, nationalism, and Euro skepticism; Brexit; Russian meddling in Europes Eastern borders and politics; US unwillingness to commit to supporting NATO allies; and recently, Merkel’s inability to form coalition in Germany. For the time being, and excluding Russian meddling, I see these headwinds mainly as noise in region which is otherwise hitting its stride after the 2008 financial crisis. Tailwinds for Europe include the election of a more business minded president on France, Francois Macron; generally good management of the refugee crisis which over the long term may serve as a springboard for growth by improving demographics; and prolonged accommodative monetary policy combined with a rebound in the global economy which will help drive export led growth. I believe that Europe is likely to continue to expand, albeit at a moderate pace. However, when the next financial crisis hits, the Euro zone is no better prepared than it was for the last one. Unless the structural flaws which the great recession exposed are addressed, the next recession may well cause the disintegration of the Euro Zone. From a debt and income perspective, China is like US and Europe in 2003 in the sense that debts are increasing at a higher rate than income (Figure 7). Unlike Europe and US during that period Chinese GDP growth is slowing, albeit from a very robust pace. The ‘regulatory storm’, as it is being referred to, is slowing debt growth and lowering other stimulative forces in the economy. It is a risky time for the Chinese economy, but there are three factors which improve China’s prospects. movement of the economy towards a consumer model which is less dependent on external demand for growth. China has picked the best parts of open economies and combined them with the best parts of controlled economies, then employed a strategy to aggressively modernize and grow its economy by directing capital and other resources where needed. While growth may be slowing and debts may be increasing, the three factors listed above as well as economic gains China made in the last several decades will help China de-leverage smoothly. China does have a debt problem which it needs to address, but they are well equipped to provide a soft landing. Doing so in the midst of a expanding global economy only increases the chances of success, or put differently, reduces risk of imminent crisis. In a turn of events which surprised many (myself included), the global economy has hit its stride. I believe the global expansion has legs for another 1-2 years. No major economy is currently over heating, and there are currently no imminent economic crisis. The US economy is furthest along the expansion phase and is now operating above its potential; it is therefore most at risk of over heating. Slack has all but disappeared in the labour market and inflation should begin to increase in the coming months above the Fed’s target of 2%. The Fed will further normalize monetary policy. With interest rates at historical lows, debts at historical highs, and increasing inequality, the economy is more fragile than some of the headline numbers show. Because of this, there is increased risk of tightening too quickly and triggering a recession sooner than would otherwise happen - this happened in 1937. The Fed appears aware of this risk and is taking a very gradual approach to tightening. In the US, inflationary gaps on average last over 2 years, for the aforementioned reasons this one will likely be shorter and the next recession is likely to be deeper. In the next recession, the Fed will not have the luxury of high interest rates to lower and will embark on a asset buying program to stimulate the economy, which will have limited impact in a low yield environment. The government will then be forced to step in and give money to families and business to invest, in the form debt write-offs, interest free loans, and tax breaks. China will continue to attempt to orchestrate a soft landing de-leveraging. The key will be if the party can find the right formula. The odds are against them, but given their aforementioned advantages, China is uniquely capable of orchestrating a soft land. We remain cautious on China as we believe a crisis in the region would have strong spillover effects in the global economy. Europe will grow until it is derailed by either internal turmoil (see risks to forecast below) or until a decrease in global demand. I believe this will happen in the next 2 years as a result of the US economy over heating (or being cooled too quickly) and/or the China’s deleveraging. In the meantime we do not believe Europe poses a major risk to equity bull market. Economic Trend: increasing inflationary gap with rising interest rates. Duration: 1 to 2 years. While history tells us economies do not stay in equilibrium, currently no major economy is over heating. US economy is furthest along in the cycle and will likely be the first major economy to over heat and cause the next global recession. China is in a sensitive debt position, there is risk a “soft-landing” deleverging is not orchestrated. US political instability/grid-lock creates an environment which is anti-growth/investment. Geopolitical instability in eastern Europe, or the Korean Peninsula, or in the Middle East causes a major war. It will continue to be a good time to be long equities. Figures 8 and 9 show results of my GDP gap model. The model employees is a Bayesian Network algorithm, trained on US economic data. The US is in a increasing interest rate, inflationary gap, and likely increasing inflationary gap environment. Based on historical evidence, our model indicates very high likelihood of a continued bull market in equities (green circle in Figure 9). When will I be worried? The first indicator for me will be closing of the inflationary gap. This will be a sign the economy is cooling, and increases the probability of an end of the equity bull market. The most important variable is monetary policy. If the economy cools per above and the Fed responds by lowering interest rates, that will be a very strong indicator that the bull market is over (purple circle in Figure 8). Until either of these indicators presents, or I believe one of the three risk I mention above has a strong chance of occurring, I will remain long equities. The level of output which an economy can produce at a constant level of inflation is its potential GDP. The potential GDP of an economy is dependent on monetary factors and its productivity. An economy’s demand for products can differ from the its ability to produce those products for various reasons. When it does, either an inflationary or recessionary gap develops. For example, when consumers or governments spend at high levels and businesses invest, the demand for and production of, goods can temporarily exceed an economy’s potential to produce them. The economy will ultimately produce the goods, however at increased prices. In this situation actual GDP temporarily exceeds potential GDP causing an inflationary gap. The inflationary forces and authorities reactions to them, ultimately cause the gap to close. When consumers or governments do not spend and businesses invest at low levels the process is reversed, actual GDP is below potential GDP and a recessionary gap develops. The deflationary forces and authorities reactions to them ultimately close this gap as well. Despite what most economic models assume, economies rarely operate in equilibrium where actual and potential GDP are equal. Instead they are in a constant state of flux: flipping between inflationary and deflationary gaps. Monetary and fiscal authorities seek to balance the gaps and reduce extremes through the use of fiscal and monetary policies. Since the 2007 financial crisis the US economy has been in a recessionary gap (chart 1), much of the world has as well. The US government and the federal reserve system has been attempting to spur spending and investment through low interest rates, asset purchases, and fiscal stimulus. While many uncertainties remain, more observers are beginning to see green shoots for US and global economies. Since an inflationary gap may soon develop, now is a good time to take a quantitative look at inflationary gaps to determine if they hold any predictive ability for equity markets. In this edition of Quantessential views we take a statistical approach to inflationary gaps and develop trading strategies around them. Specifically, we attempt to determine whether investors can accurately predict a market top during an inflationary gap period. Source: FRED, Yahoo, Vital Data Science Inc. Since 1945 there have been 9 periods of inflation gaps and most have ended in a recession. The median duration of an inflationary gap has been 11 quarters, the mean duration is 10 quarters (indicating a probability distribution with a slight negative skew), and the standard deviation of inflationary gap durations is almost 7 quarters. The reason why inflation gaps generally end in recession, and hence usually contain a market top, is a result of strong economic conditions which create inflation. Central banks respond to the inflation by raising interest rates. At some point the combination of increased debt costs and price escalation cools the economy off, decreases demand, and ultimately causes a recession. Before the recession, equity markets usually start to decline. During inflationary gaps, interest rates generally begin by trending up, then trend down as the economy begins to cool. Vital Data Science analyzed inflation gaps, interest rates, and SP500 prices using a factorized bayesian model in a attempt to determine advantaged periods for long/short equity positions. The results are summarized in chart 2. With data going back to 1945, a 3 node bayesian network model was developed using two parent nodes, Fed fund rate and actual vs potential GDP, and one child node, SPY. Fed funds rate was factored into two levels: up trend and down trend. Actual vs potential GDP data was factored into three levels: inflationary gap - early stage ( <= 6 quarters), inflationary gap - late stage (>6 quarters), and deflationary gap. SP500 data was factored into three levels: up trend, top, and down trend. Factorization was done using a proprietary algorithm, which characterized trends by looking at local bottoms and tops. The goal was to determine if any combination of levels in the parent nodes would yield higher probabilities of success in either long/short SPY positions. As shown in chart 2, it is that it is difficult to predict market tops accurately based on interest rate action and inflationary/deflationary gaps alone. Further, regardless of inflationary gap, deflationary gap, and interest rate action, equities tend to trend upwards. However, there are times when a market top is more likely to occur. If an inflationary gap has gone on for 6 or more quarters and interest rates are decreasing, then based on historical market behaviour there is a 30% of hitting a market top and 70% chance the market is already in a downtrend - not a good time to be long equities. Bear markets followed by recessionscan last longer than a year making this information is useful and investable. Our analysisalso showed that market bottoms occur most frequently during recessionary gaps and when interest rates are decreasing, proving Warren Buffet’s quote, “be greedy when others are fearful, be fearful when others are greedy” statistically accurate. Early stages of inflationary gaps (<6 quarters) are generally bullish equities regardless of the interest rate environment. 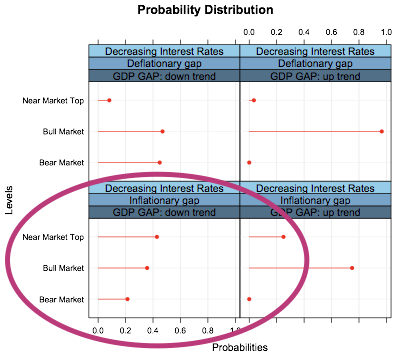 Timing inflection points within inflationary gaps or interest rates (i.e. when an uptrend changes to a down trend) had no predictive abilities according to our analysis. Our simplistic inflationary/deflationary gap and fed funds rate model predicts likelihood of a continued uptrend in equity markets, inline with calls form many analysts. We, however, remain a little cautious. There are many variables which this particular analysis did not consider: high equity valuations, high debt levels (globally), low global GDP growth, and high geopolitical tension and political gridlock in the US. When we layer these variables into our analysis, the result is less certain. We have positioned ourselves long US equities (using a value approach to stock selection). We are hedged with a position in gold bullion, and as we have closed out our short CDS swap position recently we are holding a larger than normal cash position as we search for opportunities - the topic for the next post. Any material provided in this note is for general information use only. You should not act based solely upon the materials provided herein. Vital Data Science Inc. advises you to obtain professional advise before making investment decisions. Your use of these materials is entirely at your own risk. In no event shall Vital Data Science Inc, its officers, directors or employees be liable for any loss, costs or damages whatsoever. We recommend Ray Dalio’s “Economic Principles” document, it is a highly informative read. The document offers insight on how the worlds largest hedge fund makes investment decisions and views the global economy. We hate to summarize the document as doing so removes many of the nuances contained therein, however the document describes the relationship between debt and economic growth superbly, therefore a very brief summary of one of its sections is an excellent introduction to this edition of Quantessential Views. Debt is key to Mr. Dalio's understanding of the economy. In his view there are two main types of economic cycles: a short term debt cycle, and a long term debt cycle. The short term debt cycle is the typical 5-7 year cycle ending in a recession triggered by a tightening in private sector credit expansion through a tightening in monetary policy. The tightening is necessary because the top of this cycle is characterized by demand exceeding capacity to produce, increasing inflation beyond a desired range. This is the business cycle most of us are familiar with. The long term debt cycle occurs every 50-75 years and ends when debts rise at a much higher rate than incomes and can no longer be serviced. Mr. Dalio believes that we began to experience the end of a long term debt cycle in the 2008/2009 recession. The last time this occurred in the USwas in the 1930s. In this edition of Quantessential Views, we look at the significance of debt, briefly look at the 1930s and highlight parallels to today, surmise what may come next, and discuss how we are positioning our portfolio to take advantage. Figure 1 shows correlations between various economic statistics and asset prices between 1945 and 2000. In this timeframe, the ability of the economic system to take on more debt and service existing debt was high. For most of this period, debt was growing at the same rate as income, and in periods where it was not it was possible to lower interest rates to ease debt servicing pains and allow more debt creation. As can be seen, in this period, debt levels are highly correlated to SP500 returns, GDP, and CPI. Figure 2 shows correlations between the same economic statistics and asset prices between 2000 and 2008, a period where debt levels in the economic system were high. To refer to Mr. Dalio’s document, this period is the tail end of the long term debt cycle: debt creation is escalating at a faster rate than incomes, and interest rates are near zero and generally heading down. In this timeframe, debt levels and equity values were less correlated. Interestingly, in this period a relationship between VIX and junk bond yields develops. Figure 3 shows the same correlations between 2008 and 2Q16, a period where some deleveraging occurred, but mostly debt levels changed at the same rate as incomes. Historical correlations between debt and equity returns, GDP and CPI return; the relationship between VIX and junk bond yields holds. The purpose of these correlations is to highlight that at different debt levels asset returns are influenced by different macro economic statistics. However, in general, debt is a good proxy for economic growth and equity returns. After the 1929 market crash, the subsequent depressionairy period of the early 1930s was characterized by deflation, bank runs, and debt crisis. Authorities reaction to the crisis was limited by the dollar’s link to gold, and deflationary policies like increasing taxes and lowering spending. In 1933 Roosevelt took office, effectively removed the dollar off the gold standard, and instituted a number of stimulus programs - including printing money and giving it directly to citizens through initiatives such as the Home Owners Refinancing Act and the Farm Credit Act. The economy responded - asset and prices increased, GDP growth accelerated, unemployment fell, and inflation started to increase. When the 1937 contraction hit, the Federal Reserve System lowered the reserve ratio again and continued to print money. Come 1938, the Federal Reserve Systemwas out of traditional tools to stimulate the economy as reserve requirements were low and the discount rate was near zero. However, at this point World War II broke out in Europe and the US economy was first reflated by demand from European allies, then by federal government demand when the US joined the war. The post war years saw the global economy benefit from many factors including favourable demographics, the rebuilding of Europe, and the globalization of supply chains. What makes the 1937 recession interesting is parallels to the current period. Similar to today, the US economy recently went through period of deleveraging, economic stimulus has been employed liberally and was reaching its limits, there were expectations of inflation in the near future, tightening monetary policy, and a fragile global economy. Governments have fiscal stimulus tools at their disposal, which can be generalized in two categories: a) creating demand (i.e. defence and infrastructure spending); and b) giving money to citizens (i.e. providing low interest loans or erasing loans); these can be employed in conjunction with or irrespective of monetary policy. Chart 1 shows US household, business, and government debts to compensation, profit, and receipt ratios, respectively. These values were calculated using each groups corresponding GDP contribution. Chart 1 represents the relevant debt/GDP ratio for households, business, and government. The purpose of creating the chart is to highlight: 1) business and household debt levels relative to income have come down since the ’08/’09 recession, however remain near historical highs; 2) Household/Business debt reduction has been offset by government debt increases; and 3) Government debt to income has stabilized, while household and business could be showing signs of increasing. Chart 2 provides a specific view of the combined data: we graph the cumulative difference between debt/GDP growth percentages over the time period and overlay the Fed Funds rate. The purpose is to highlight periods (shown as a negative slope) where debt growth exceeds GDP growth. Highlights include: 1) over the chart’s time frame, debt has generally either grown inline with GDP or at a higher rate; 2) since 2008 total debt has generally grown inline with GDP, however some deleveraging took place in the 2010-2012 timeframe; 3) interest rates can no longer be used to stimulated debt growth. Prior to the election of Trump our belief was that the slow deleveraging which started after the 2008 recession would continue, along with slow economic growth, job creation, and income growth in the short to medium term. Based on this, our belief was that equity prices had run ahead of themselves. Our current view is Mr. Trump’s administration picks, expected financial deregulation, potential fiscal stimulus, and his belief that banks are not lending, combined with relatively low interest rates and increased ability of consumers and business to lever up may create an environment in which debt creation will ramp up. This would fuel consumption, inflation, and corporate earnings in the short to medium term. Given that the Fed has been supportive of economic growth and is not fearing inflation we believe that this phase of high debt creation can last for a multi year period. Chart 3 shows the delta between potential and actual GDP, recessions, and SP500 returns. The chart highlights deflationary and inflationary gaps, which we believe are a good predictor of monetary policy and recessions. An inflationary gap exists when actual GDP > potential GDP. This causes inflation outside of the Fed’s target, the Fed raises interest rates, debt growth is slowed, demand drops, markets correct, a deflationary gap is created, interest rates are reduced, the cycle continues. By this measure (currently a deflationary gap) the US economy has room to heat up before inflation becomes a problem and monetary tightening becomes aggressive. When they occur, inflationary gaps generally last slightly over 2 years; however historical data exhibits a large standard deviation (over 1.5 years) with a right skew. Therefore, when an inflationary gap opens, the balance of probabilities is that condition exists for a period that is shorter than the average of ~2 years. Both household and businesses have the ability take on more debt as both reduced debt levels since the financial crisis, however, debt to income levels remain near peaks. Further, currently earnings and income growth is relatively tepid, and regardless has fallen behind debt loads in the past several decades. So while households and businesses have the ability to take on more debt and spend it, debt fuelled spending/investment will likely be short lived. Europe is deleveraging. The deleveraging in Europe started later than in the US (chart 4), and was more complicated due to the nature of the economic union and the decision to not adopt quantitative easing and fiscal stimulus early after the financial crisis. As a result, Europe is behind the US in macro economic terms: inflation is low, job creation is minimal, unemployment is high, and GDP growth ranges from negative to anemic in most countries. China is behind further in their debt cycle as it continues to lever up (chart 4), and we believe that despite the current blasé attitude, events in China have the potential to be a negative catalyst for global macro conditions in 2017. Debt rates relative GDP are high and growing (charts 4); currency is flowing out of the country putting pressure on yuan (chart 5); and trade wars are brewing. Recent denial by the EU and US of ‘free market status’ in the WTO, combined with the potential of the new US administration to label China a currency manipulator, and China’s recent tweaking of the basket of currencies it pegs the yuan (lower the contribution of the USD) have the potential to increase trade tensions between the US, China, and the EU. Any of the following Chinese scenarios, or a combination of them, would cause investors to increase risk premiums with spillover effects to the global economy: 1) debt bubble bursts causing tightening credit conditions; 2) capital outflows put pressure on currency causing Chinese companies with US debt to having issues servicing the debt and tightening credit conditions; and 3) trade provocation with the US slows trade, growth, and adds to global uncertainty. In our view, these are probable near/medium term events which are not currently priced into asset valuations. To take of advantage of our economic outlook, we have positioned our portfolio to be long US equities, hedged with gold; and short positions in CDS. Globally, we believe that many of the tools which governments and federal reserve banks will continue to employ will put downward pressure on currency values. Further, with equities trading near extreme valuations, and inflation and rising interest rates putting pressure on fixed income, through the process of elimination we see gold coming into favour with investors in the near to medium term. Given this view and golds historical low correlation to equities we believe it is a reasonable hedge. We have further hedged our equity positions by taking the short side of CDS positions. We like the risk/reward of this trade because the cost is lower than purchasing long term puts or shorting (without entering complex cost offsetting arrangements); the high correlation between volatility and junk bond debt yields; and, since the position is likely to have some intrinsic value under most scenarios, we are comfortable holding the position for a longer period, reducing our dependence on timing the markets. Maintaining stability at home for the long term. Post the 2008 financial meltdown, Saudi Arabia has steadily lost market share in the USA to high cost US shale and Canadian oil sands producers. Their position as the USA’s Arab ally has deteriorated as evidenced by the Iranian nuclear deal and lifting of sanctions, and challenges from Shia nations in regional conflicts (i.e Syria and Yemen). To reassert their status, the Kingdom is playing their best hand. Is the strategy working? Below Vital Data Science analyzes the effects of Saudi Arabia strategy and surmises what comes next. While in United states oil production is down (chart 1) and imports are beginning to rise (chart 2) implying the strategy is working, a closer look reveals a more complex picture. This war is not for the USA market share. Source: EIA, Vital Data Science Inc. The largest benefactors of the drop in US production have been Iran, Iraq, and Kuwait in OPEC; and Canada and Russia in the non-OPEC producers. Iran and Iraq are enemies of Saudi Arabia; Russia is aggravating Saudi Arabia in Syria; and Canada is a high cost producer. So while high cost shale production in the USA is on the decline (chart 3, note that gas production is stubbornly holding in), the Kingdom’s strategy has not played out as expected quite yet. As we show below, the future of oil demand is outside North America and the OECD, and here Saudi Arabia is also facing stiff competition, however is well positioned. Oil economics are a function of operating costs and geology. Geology is a major determinant of drilling costs as it dictates well depth, length of horizontal, and completion strategy. However, recently market forces have exerted great influence on drilling and completion costs as well. Geology also influences the revenue side of the equation by dictating the composition of the hydrocarbon coming out of the well, initial well pressure and flow rate, and well decline rate. In the shale basins, as a resource play develops three things happen: 1) wells become more productive; 2) rigs become more efficient; and 3) wells become more ‘complicated’ (i.e longer horizontals, more proppant, more fracking stages, etc.). How these dynamics balance combined with the hydrocarbon composition and commodity prices determine the play’s overall economics. Chart 4 is a graphic representation of items 1 and 2, and it can be seen in Chart 4 that rig efficiencies have significantly increased in all major USA shale plays, however increases are now slowing as many producers have found the right formula in each play. Chart 5 illustrates item 3 where, like rig efficiencies, well complexities appear to have peaked. The result of well and rig efficiencies peaking and producers finding the correct well type in each play is the commoditization of drilling and completion services. When a product becomes commoditized, differentiation disappears and price is determined by supply and demand factors. We come back to this point below. Producers drill wells and market the product. If producers earn acceptable returns (common hurdle rates in the oil and gas industry are between 10% and 15%) they will drill more wells. When lots of producers in lots of basins earn acceptable (or better) returns, rig counts increase; otherwise, the opposite occurs. Current rig counts are far below production sustaining levels (Chart 6) indicating, as everyone knows, producers are currently not earning acceptable returns. Coming out of the financial crisis, the majority of drilling activity was focused on shale basins which are characterized by high initial production rates followed by very high decline rates (Chart 7); as USA producers have stopped drilling production has began to decline (Chart 3) and domestic barrels are being replaced by imports (Chart 2). Due to the commoditization of drilling and completion services, lower demand has driven the cost of these services down significantly. Lower drilling and completion costs combined with higher well and rig efficiencies have made domestic shale production competitive with imports. Has well productivity increased and costs decreased enough to drive out imports and increase domestic production? Table 1 shows recent drilling, completion, and infrastructure costs, as well as operating and breakeven costs for some of the main US shale plays. It can be seen most plays have locations in the money at today’s commodity prices, however shale producers are unlikely to get too excited about deploying capital until WTI is above $60/bbl and is expected to stay there, as this pricing would enable mass drilling of economic wells. Source: EIA, Rystad Energy, Vital Data Science Inc. In Canada, oil sands production needs relatively high (>$65/bbl) oil prices to achieve adequate full cycle returns, much higher for mining projects. The crude produced in the oil sands, though some is upgraded, is generally heavy grade and receives a significant discount from WTI, so a WTI price of more than $75/bbl is likely needed before Canadian Oil Sands producers get excited about expansions again. However, oil sands operating costs are in the neighbourhood of $35/bbl and dropping, so while we will not see any expansion projects in the oil sands (excluding Fort Hills which is almost complete) being started any time soon, the recent increase in prices will be enough for Canadian heavy oil and oil sands producers to continue to bring on shut in wells and continue pumping. Canadian shale production has breakeven prices that range with the top USA plays, however Canadian producers pay higher prices to market their products which disadvantages their hydrocarbons versus similar plays in the USA, and is why Canadian rig counts have been hit even harder than those in the USA. Canadian rig counts should not be expected to increase significantly through 2017 and gas production will begin to decline; oil production as well, but less than gas because oil sands production will hold in (assuming a return to normal operating rates post recent fire event). While OPEC conventional production enjoys very low breakeven prices, fiscal breakeven prices are a different story. A recent analysis by the Dallas Fed shows the fiscal breakeven price of the oil producers and assesses their ability to continue competing at today’s commodity prices (Table 2). Excluding Qatar, no OPEC member’s production is economic on a fiscal basis. However many of OPEC’s larger members have the ability to withstand low oil prices for years and even decades (Kuwait, Qatar, UAE). They can tap capital markets, reduce and eliminate subsidies, increase taxes, and tap sovereign wealth funds. All ofthese options will be painful, however. Consider Russia a weaker OPEC member - low well breakeven price, high fiscal breakeven price, low tolerance to withstand current commodity prices for long. While they have taken admirable steps to avoid what seemed like imminent catastrophe, the economy is in shambles and continuing to deteriorate. Look for Mr. Putin to continue Orwellian tactics which serve three purposes: focus attention domesticallyaway from the economy; blame deteriorating economy on outside forces; and retain sphere of influence on the global stage. There is a limit to the success of these tactics and it is quickly being reached. Expect increased internal volatility and external hostility from Russia. While Russia bas been successful at stealing market share in the oil war, this will become more difficult as the countries private and government finances become constrained and sanctions remain in place. In summary, USA shale oil and gas production is declining, and while increased well productivity and the commoditization of oil field services has made USA shale plays more competitive, oil below $60/bbl WTI will not incentivize much new drilling activity. Canadian shale production will follow asimilar production profile as USA shale production. Canadian oil sands production will hold at current levels even though recently competed projects will not achieve acceptable returns - capacity additions in the oil sands are a thing of the past for now. Russian production will decline from lack of investment. Weaker OPEC nations are already starting to see production decline from lack investment and this will continue. OPEC’s strong nations, like Saudia Arabia, will be able to grow production and win back market share. The Kingdom’s strategy is working, it is just taking. The USA is currently the worlds largest consumer of hydrocarbons (Chart 8), however the future of oil consumption is outside of the USA and OECD (Chart 9). Consumption of hydrocarbons inside the OECD is stalling, while outside of the OECD it continues to grow. Particularly strong growth is occurring in India, Africa, and China (Chart 10). Asia now accounts for a larger share of liquid fuel consumption than North America with higher demand growth rates than North America. With European demand in decline, in the near future Asia will surpass North American and Europe as the key demand centre for liquid fuels. Historically, Saudi Arabia has been China’s main supplier, however Russia is stealing market share and in 2015 became China’s largest oil supplier. Russia’s geographic proximity to China and willingness to provide flexible deal terms have allowed the Russians to steal market share. As Russia becomes more isolated in Europe, the Chinese market will become more important. India is mainly supplied by Iran and Iraq. If the Kingdom is to grow market share in India, it will be competing with other low cost suppliers, however neither Iran nor Iraq has the capability to withstand low prices for as long as Saudi Arabia. Currently Africa only consumes about 4% of the worlds liquid fuels, however is the fastest demand growth region on the globe. With a young population, developing economies, and growing transportation infrastructure, in the long term Africa has the potential to be a prize for oil producers. However, the continent is self sufficient in oil, and acts as an exporter and competitor to Saudi Arabia. Current market dynamics and geopolitical pressure are incentivizing Saudi Arabia to keep pumping, which is what they will do. Iran and Iraq who are both trying to increase production after years of sanctions and war are also incentivized to keep pumping, lest they lose market share or regional clout to Saudi Arabia. Canadian oil sands producers will keep pumping and take market share in the USA. Russia and the weaker OPEC members will will try to hold in but ultimately see production declines from lack of investment; there will be tension in these countries and will spill over their borders into their region (i.e. Europe, the Middle East, and Africa). Production is declining in many basins, and countries with less formidable war chests than Saudi Arabia are coming under pressure as a result of lower oil and gas revenues. The gap between supply and demand is narrowing (Chart 11). Anticipation that recent supply disruptions may close the gap sooner than initially expected has powered the price of crude in recent weeks. While global oil supply and demand is beginning to physically balance, it will take time. Currently at historical highs and continuing to rise, the pace of global crude inventory increases is beginning to slow (Chart 12). When inventories stabilize, likely sometime in 2017, sooner if current supply disruptions continue, oil prices will have support to stay above $50/bbl. Lack of investment in Non-OPEC supply nations will lead to declining production and strong OPEC players will increase production to take market share, however at the expense of decreasing their spare capacity. As spare capacity diminishes and demand rises at a faster rate than supply (Chart 11, Chart 13) a pinch point will be reached. An important consideration is the response USA shale producers to $50/bbl crude. There are two points to consider: new drilling, and the inventory of drilled but not completed wells - the so called fracklog or DUCs. As we have shown, a $50 barrel will likely not trigger mass drilling increases since many wells are still either marginally, or not, economic at this price. Rystad, and energy consultancy, estimates that there are approximately 4,000 drilled but uncompleted wells in the USA. Of these wells, approximately 1 mmbbls/d of production is economic at $40/bbl. If these wells can be completed and production put online, then much of the USA’s declining production can be offset without incremental drilling, keeping inventories high and putting a cap on prices. This was not happening at $30/bbl but will as prices have stabilized over $40/bbl and have touched $50/bbl, we can expect some producers to go in and start completing drilled wells to capture the cashflow. The fracklog will not offset USA production declines completely, and production will continue to decline. In summary, the oil market is beginning to show signs of physically balancing. However, high inventories, OPEC production increases, and the fracklog in the USA will keep the market over supplied through to the first half of 2017. In 2H17 and beyond, the oil market will begin to tighten, and may even see a pinch point during times of supply disruptions, price can then increase significantly above $50. Lack of investment in the industry will leave it susceptible to supply shortages during periods of high geopolitical, weather, or other related stresses. If you have not already stepped into energy investments, given our macro view, this is may be a good time to begin entering the space. As many companies have already rebounded substantially from cyclical lows, balancing valuations with future potential is critical. Companies which will succeed are those which have weathered the low commodity prices successfully as a result of financial discipline and a strong asset base, have large well inventories and can drill or complete those well inventories. Below we analyze Marathon Oil Corp. and Noble Energy, two American non-conventional oil companies. Both are well setup to succeed in a low commodity price environment, however the analysis illustrates two different paths through the commodity cycle and how they impact equity investors. The commodity price plunge has been an event which, as Mr. Buffet once famously said, showed who’s been swimming naked as a result of the tide going out. Marathon (“MRO”) and Noble Energy (“NBL”) are two well respected, USA based exploration and production companies. Both are heavily invested in onshore, domestic shale plays, and both provide international exposure. MRO is heavier weighted to liquids with ~70% of production coming from liquids, versus ~45% for NBL. Whereas NBL has been able to grow production since the oil wars began, MRO’s production has cratered along with its valuation (Charts 14/15). We believe that NBL is the better investment. Before diving into the comparison, a very brief review of key financial metrics. Both companies are financially stable relative to the sector. MRO completed a financing at the end of February 2016 to shore up their finances, whereas NBL has been able to maintain a stable investment grade credit rating without tapping equity markets. Both companies are positive cash flow, and both companies have have current ratios north of one. This is where the similarities end. Source: Company reports, Vital Data Science Inc.
NBL consistently generates more cash flow and consistently holds lower per boe breakevens (Charts 16/17). NBL’s drilling success has given the company a higher valuation relative to MRO, it trades at a ~$15,000 per flowing boe premium (1.3x) to MRO (Chart 18). On average, NBL will generate >2x more cashflow per boe produced than MRO, last quarter NBL increased their edge over MRO to 3x (Chart 19). Therefore, on average a barrel of hydrocarbon in NBL’s hands will generate two to three times more cashflow to an investor than a barrel of hydrocarbon in MRO’s hands, but only costs investors 1.3x more for that barrel. Reserves are an important factor when evaluating oil and gas exploration companies, and this is where MRO has the significant edge at 15 years of proved reserve life at current production rates, vs NBL’s 9 years. However, given NBL investment grade credit rating, ability to generate cash flow, and the liquidity of oil and gas properties in the USA, current reserve life is not a valuation defining issue. NBL will always be able to tap the market to purchase reserves as they deplete their existing ones. Further, a major cause of MRO’s longer reserve life is simply the fact that they’ve let their production slip. On the surface MRO and NBL look similar, a deeper drill provides a example of two different paths through the commodity cycle. NBL maintained an investment grade credit rating, high cash flow, and did not issue equity. MRO, despite having an excellent asset base was not able to find the same financial success. While NBL rates at 1.3x MRO price per flow boe, they are able to generate 2x-3x more cash flow per flowing boe and therefore present a buying opportunity. It has taken some time but the Kingdom’s strategy is working. While significant competition for market share exists, Saudi Arabia is well positioned to outlast weaker rivals and ultimately take back their market share. However, in any war there are casualties and collateral damage: North American drilling has collapsed and weaker, debt laden producers are going out of business; weaker oil producing nations’ economies are in free fall; and even the Kingdom has been forced to contemplate and adjust to life in a lower for (much) longer pricing environment. The oil market is beginning to physically balance, however will likely not return to tightness until mid 2017, unless current supply disruptions continue. World demand is currently growing at a faster pace than supply and OPEC is pumping harder to capture market share; when balance in the oil market is reached there will be less spare capacity than there has been historically available to cover inevitable supply shocks. Thus, a new bubble is being created. Now is not a bad time to step into the space, however investors ought to be mindful of company valuations which may have outpaced future prospects. Investors should seek out companies with healthy balance sheets, large land positions in key shale basins, and large well inventories which be quickly drilled. One such company we believe will succeed is Nobel Energy. If only it were that easy. At some point you will lose some money, even Mr. Buffet has. Understanding how much money is at risk in your portfolio over a specified timeframe can help minimize those losses, or at least help understand them. Further, having the ability to construct portfolios which match investor risk appetite, and understanding how different financial instruments in a portfolio correlate under normal conditions is extremely useful to investors. Value at Risk (“VaR”) is the tool which accomplishes this. In this blog Vital Data Science discusses VaR and provides R code which will calculates VaR for any portfolio. Given a probability (commonly 95%) and a timeframe (commonly one day or two weeks), VaR measures the maximum loss the portfolio can likely experience. For example, a VaR of $1 million at a 95% probability, means there is a 95% probability that current portfolio holdings will not lose more than $1 million over the specified time horizon, under normal market conditions. The ‘under normal market conditions’ is a critical qualifier. As correlation of asset returns is used in the calculation of VaR, in stressed market conditions where all asset returns are closely correlated VaR is not an accurate measure of possible losses. There are two ways to address this short coming. If the investor needs to quantify the possible loss which can occur during periods of extreme market stress, the investor can find such an event in history and calculate asset returns, standard deviations, and correlations, then use those in the VaR formula. Or, since extreme market volatility events often occur in clusters and are usually preceded by market distortions (i.e. extreme valuations not supported by trade flows or fundamentals), another way to deal with VaR’s short comings is to simply understand them, acknowledge them, and adjust your market behaviour accordingly. The multiple of the standard deviations of portfolio returns at the required probability/confidence interval. For example, given a required probability of 95%, and assuming a normal distribution, the confidence interval value is 1.65. Time period is simply the amount of days for which you would like to calculate VaR for. Therefore, for a two week period, the square root of the time period is the square root of 10. VaR is a simple and quantifiable technique that illustrates the impacts of diversification. By adding long/short positions in various assets, determining their statistical properties and how the assets interact with each other, an investor can design portfolios which target specific risk/reward profiles. Often investors will set a VaR target which a portfolio is not to exceed. In this case VaR would be measured daily, and if calculated VaR exceeds allowable VaR, the trader would need to hedge, liquidate some positions, or take other actions to reduce risk. VaR has two major short comings. 1. Past asset behaviour is not always indicative of future asset behaviour. This can happen for various reasons ranging from systematic to those specific to the asset. For example, a new rule, market structure, or competitive dynamic may change the way investors hedge or hold assets, therefore changing previous asset correlations and standard deviation of returns. One example of this type of scenario is the increased use of index ETFs as a hedge tool and/or a replacement for cash in portfolios. This change in investor behaviour, driven by market structure and competitive dynamics has changed how those instruments behave. Another example is a firm maturing in their business model. Where before such a company may have seen less competition with share price returns having low correlation to the overall market, if the firm is now in a mature industry it will be competing on price, achieving lower unit returns, and whose economic fortunes are more correlated to the general economic business cycles. 2. During periods of extreme market volatility asset correlations tend to significantly increase, thereby reducing the benefit of diversification. The best example of this point is during a financial crisis where all investors are heading for the exit doors at the same time. When this occurs, all asset prices tend to fall irrespective of historical correlations and few true hedges exist. VaR is no silver bullet - nothing is. Investors must be vigilant with their portfolios in order to understand when and why historical correlations and standard deviations of returns are not applicable. Investors must also be able to forecast periods when markets have a higher chance of experiencing larger than normal losses and adjust portfolios accordingly. The risk in doing so is that by adjusting for some event which does not occur the investor will lose out on a large run up in prices. This is a legitimate risk and is the downside of protecting a portfolio. However, portfolios can be protected cheaply and without exiting positions through the use of options and other derivatives. As well, pure alpha strategies can be employed to minimize systematic risk to the portfolio. For Vital Data Science views on the market and information on pure alpha strategies please sign up to receive our research here. We will now present our R code for calculating VaR. Two inputs to this code are necessary: a portfolio which resembles Figure 1, and a pricing file which resembles Figure 2. In our code we do not assume a standard normal distribution accurately represents the portfolio return characteristics. We fit Cauchy, Normal, and T distributions to the portfolio return then select the most appropriate. Note: this code is being provided for educational and information purposes only. It is being provided for free. We offer absolutely no guarantee or warranty as to accuracy, correctness, usefulness, or results of this code. It is up to the user to verify the code and ensure correct results. Use at your own risk. With markets in turmoil, inflation all but non-existent, and global GDP growth stalling, the FED’s next significant move will be to follow many other central banks and ease. As interest rates have only moved up by a quarter percentage it is likely quantitative easing or negative interest rates are coming. Most major market participants are now aware of this, opinions on whether it is a good idea are divided. At Davos, some attendees were calling for global central banks to stop easy money policies and let economies correct. In this note we explain why this is unlikely and how we will take advantage of the FED’s next move. One of the main purposes of quantitative easing was to inflate asset prices. The idea is: when asset prices increase consumers feel confident and start spending, businesses hire and invest, inflation rises, and the economy normalizes. Our analysis shows only moderate correlation between household net worth and future consumer spending (Chart 1). The correlation between net worth and consumer spending peaks out at ~0.60, with consumption lagging net worth by two months. One of the reasons for the moderate, not strong, relationship this is that financial assets comprise an ever increasing share of net worth. As most financial instruments are marked to market daily, changes in market price cause wild swings in consumer and business sentiment (Chart 1 and Chart 2). As we’ve pointed out in a previous note, many American consumers have been left behind by an economy with global supply chains, knowledge sector growth, and the rise of low wage and temporary work. Instead of the intended purpose, easy money policies have artificially inflated asset prices. Haunted by the great recession and left behind by the economy, consumers have focused on deleveraging and saving instead of spending, which is one of the reasons why inflation has not taken off. As consumers deleverage businesses have taken on debt, and instead of using the debt to invest in the future they have used it to artificially inflate earnings per share through share buy-backs (Chart 3). Large share buy backs mask the fact that earnings and sales in S&P 500 firms have declined throughout 2015, pointing to weakness in the global economy. Some market participants are beginning to tire of the financial engineering and beginning to push for change - one reason why short term focused activist funds are starting to fall out of favour. Internationally, corporate and government debt binges have fuelled over capacity in China which is now experiencing slowing growth as a result. As China was the main driver of global GDP growth out of the great recession (Chart 4), and a large consumer of commodities (Chart 5a and 5b), we can expect the global economy to slow. Source: World Bank, Vital Data Science Inc. In short: today’s macro economic climate does not support current asset valuations. Investors are irrationally buying assets at high valuations because they believe that easy money policies support high asset prices and/or the macro economic climate will eventually catch up to the market. Central banks are easing monetary policy in an attempt to push economies to catch up with asset valuations and keep asset valuations high. Since consumers are deleveraging, monetary easing is having a limited impact on the real economy. At Vital Data Science, we analyze the global economy and asset prices several ways. One process we go through is to collect hundreds of thousands economic indicators, reduce and extract features, then summarize the global economy in a three dimensional visualization (Figure 1). While this tool over-simplifies the complexities and interactions in the global economy, it is useful for spotting long term trends. Our representation shows the economy peaked early 2015 and has been in decline since. We extracted features from this representation and built a model using the features as variables. We found markets lag our bull/bear indicators by 12-18 months. Back testing showed the model was ~70% accurate in predicting market swings. This model is currently predicting a bear market. Another approach we take is to run an algorithm through the macro economic statistics we collect and develop indexes representing areas of interest in the global economy. We train a model on the indexes and forecast market movements. Our model, when back tested 20 years, is 87% accurate in predicting major market swings. This model is also predicting a bear market. worldwide acceptance of unorthodox central bank policies like quantitative easing and negative interest rates. The US is not immune to the global slow down and the heat experienced at the tail end of 2015 will cool by the end of the first half of 2016. The Greenspan put is coming. You can call it the Yellen put. The FED will not raise interest rates, it will lower them, and then return to quantitive easing or negative interest rates by 2017. US equity markets will swing wildly but trend flat to negative in 2016, before the end of the year a bear market will be evident. Consumers will continue to deleverage and save through 2017. Normal spending growth will return when debt burden returns to normal levels. Then the next cycle will begin. Investors and corporate management teams will begin to adjust to the deflationary deleveraging phase in the global economy and financial engineering will peak in 2016, then begin decreasing in 2017. The world is becoming increasingly turbulent: conflicts in the Middle East, tension between Russian and the West, and tension between China, its neighbours, and the United States all have economic implications. Global political turbulence perpetuates the monetary policy race to zero and below, and increases the time required to work through global economic imbalances (i.e. oil supply/demand). In our view, this is the largest risk in the global economy over the long term. Our belief that current global economic distortions cannot be accurately reflected by existing economic models, which are trained using historical data, without significant adjustment of forecasted results, was the driver of our earlier market neutral strategy idea. Currently, we see success coming from beginning to move away from market neutral and into a net market short position. We see the buffering impact of global central banks policies having a decreasing effect in supporting asset prices going forward and believe that it will take a number of years for the real economy to catch-up to current asset valuations. In our note in December 2015, we highlighted three pair trade ideas. We continue to believe that these positions will yield success. To take advantage of our global macro view, we also highlight other ideas below. Table 1 summarizes our position ideas and results to date. To date, our position has yielded a small loss, in the same period the S&P 500 dropped 7.5%. To take advantage of our global macro view, we believe positions in US treasuries, and a net short position on the S&P 500 will yield success going forward. An example portfolio is shown in Table 2. We will optimize this portfolio as the direction of the global economy becomes more clear, in future notes. The next important check point for us is the FED’s March meeting. As we have developed enough positions to build a very concentrated long/short portfolio, we are establishing a benchmark to validate our ideas. Our benchmark will be 70% US equities represented by SPY, and 30% US Treasuries represented by GOVT. We believe that such a ‘do nothing’ portfolio presents most investors a reasonable alternative to active trading and balancing. It is easily replicated, realistic, and presents reasonable risk/reward balance. On a go forward basis we will measure results relative to this benchmark. If our positions expand to include global assets or alternative investments, we will adjust the benchmark. Any material provided in this blog is for general information use only. You should not act based solely upon the materials provided herein. Vital Data Science Inc. advises you to obtain professional advice before making investment decisions. Your use of these materials is entirely at your own risk. In no event shall Vital Data Science Inc, its officers, directors or employees be liable for any loss, costs or damages whatsoever. In our piece entitled ‘Ray Dalio is right more quantitative easing is coming’ we discussed the state of the global economy and our belief that Mr. Dalio was correct in his assertion that the FED’s next big move would be quantitative easing. Low inflation, mixed jobs data, and global market chaos prevented the FED from raising rates September through November of this year. In December, expecting future inflation, but mainly to maintain credibility, the FED increased interest rates by 0.25%. Vital Data Science’s base case view is this will continue for two to four rounds before secular forces begin to impact the FED’s decisions again. We are collecting data, calibrating models, and will have an updated view early in the New Year. 3Q15 is behind us and the theme of the earnings season was the slowdown in global economic activity, especially in developing economies. S&P 500 earnings increased at their slowest rate since the recovery began (Chart 1) yet valuations remain stubbornly high. Inflation is low, and while the US labor market shows signs of picking up, significant slack remains. With slack in the labor market, a global slow down, and a stronger US dollar, we believe there is significant risk to achieving the FED’s stated goal of 2% inflation. Further, the PMI Composite Index (Chart 2), a reasonably reliable indicator of recession risk has been in decline all year and now sits below 50. A stronger US dollar will put further pressure on the PMI Composite Index. in the short term US markets will be flat, volatile, and trends hard to forecast. Therefore we recommend a market neutral strategy - pair trades. In this piece we highlight two pair trade ideas along with one speculative pair trade. We provide the results of an analysis Vital Data Science performed, in which we found most open, cointegrated pairs of stocks on the NYSE below. For a more complete list of open pairs on the NYSE please visit part one of Quantessential Views. The idea behind pair trades is to pair a long position in one stock with a short position in another stock. The two stocks are to be cointegrated, meaning that a linear combination of the stocks is integrated of order zero. Generally, the firms are in the same industry and have similar beta so a pair trade creates a hedge to the industry in which the firms operate as well as the market. Quantitative data for the trade is summarized in Table 1. CNX (Consol Energy) is a NE US coal and natural gas producer. CNQ (Canadian Natural Resources) is a Canadian oil sands and heavy oil producer. Relative price performance is show in Chart 3. CNX stock has been hammered to the point where value investors are starting to take notice. Consol Energy produces high BTU North Appalachia coal and has been able to take market share from Appalachian producers in the commodity downturn. Increasingly they are positioning themselves as a natural gas producer in the Marcellus - the best natural gas basin in the US. Natural gas is not imported into the US, in fact it is exported to Mexico, Canada, and will soon be waterborne, helping to clear the US over supply. Marcellus well economics are competitive globally. CNX is cash flow positive and has a manageable debt position. CNX trades at 5.30 EV/EBITDA, 0.33 P/B, and 0.54 P/S. CNX is well positioned to compete in a low commodity, over supplied market, and trades at a lower valuation than weaker competitors. Because CNQ is a well-managed company it pains us to call it a short. Nonetheless we believe CNQ is overvalued relative to CNX. A business can be managed flawlessly but if cut off from markets, sells a replaceable product that is heavily discounted with high production costs, and faces ever increasing regulatory and taxation hurdles, the business will have a hard time competing. As a Canadian oil sands and heavy oil producer this is the tough position CNQ finds itself in; however on relative basis its valuation has held up. CNQ trades at 6.61 EV/EBITDA, 1.11 P/B, and 2.18 P/S. We see this gap closing within the next year driven by bad news out of Canada. Quantitative data for the trade is summarized in Table 2. PII (Polaris) is an industry leader in the powersports industry. UPS (United Parcel Service) is an industry leader in parcel delivery and freight. Both companies are leveraged to consumer financial health. Relative price performance is shown in Chart 4. Polaris recently lowered their 2015 guidance and the stock was hammered as a result. Guidance was lowered due to lower than expected Off-Road Vehicle sales and unusually warm weather impacting snowmobile sales. Top line growth was adjusted to 4%-5% compared to the previous expected value of 10%-11%. PII now trades at 1.14 EV/EBITDA, 5.95 P/B, and 1.12 P/S. PII share price appreciated significantly in 2013 when the company was growing at a record pace, but earnings growth and share price have since matured. Polaris offers a broad product suite that hits every segment of the powersport industry. With a healthy balance sheet, industry leading products, and a management team that is dedicated to growth, Polaris has many options to get out of the current rout. We believe the recent dip presents an opportunity to buy an industry leading, innovative company for an attractive valuation. UPS is a giant in parcel delivery and freight, a growing but highly competitive industry. As online shopping sales sky rocketed UPS was well positioned to reap the rewards. Coming out of the 2008 downturn UPS share price has closely tracked the broad market, and like the market UPS shares have become richly valued. UPS currently trades at 11.47 EV/EBITDA, 46.23 P/B, and 1.53 P/S. The parcel delivery business is competitive and ripe for disruption. As traditional companies fail to meet market demand adequately, online retailers will move to non-traditional options that will take market share away from incumbents. We see this trade closing within the next one and a half years as it will take several quarters for PII team to reposition, in the mean time non-traditional parcel delivery options will continue to multiply. Warning: this one is not for the faint of heart. A massive spread has developed between UPS and (MW) Men’s Wearhouse, two companies whose share are cointegrated and leveraged to consumer spending. Table 3 shows quantitative data for the trade and Chart 5 shows relative performance. For those who follow equity markets Men’s Wearhouse needs no introduction. The affordable men’s fashion retailer’s shares have been slaughtered, down over 60%, since management cut earnings forecasts down by 40% in November, and then reported very weak sales at Jos. A. Bank early this month. Men’s Wearhouse acquired Jos. A. Bank in 2014 for $1.8 billion, and largely paid for the deal with debt. Any value from the acquisition has been erased from MW’s share valuation, yet the debt remains. MW is now trying to change brand perception and consumer buying patterns to give the business a sustainable long term strategy. This will take time, there will be further missteps, additional write downs, and there is risk that the strategy will not work. While the future of MW is not clear there is potential for significant upside from the current valuation, hence why it is part of our speculative trade. The company trades at 7.05 EV/EBITDA with much of the $2.3 billion EV being comprised of $1.65 billion in debt, 0.71 P/B, and 0.19 P/S - a significant discount to its direct competitors. MW legacy brands are in good shape and the firm generates $2.3 billion in revenue without Jos. A. Bank. MW is cash flow positive and focused on reducing debt. We believe that while significant risk remains, there is potential for a phoenix to rise from the ashes. Given the overhang on MW stock, we do not see this spread closing for at least one and a half years, likely two. In an upcoming post, Vital Data Science will provide a Global Macro update and our top pair trade ideas. The files included below are part of the analysis. These PDFs are intended to be samples only. The data has been trimmed to save space. If you would like the complete excel format files please contact us. Description: Correlation and cointegration data for almost every stock on the NYSE. Sorted 1) alphabetically, 2) top 300 by correlation. Description: Potential pair trades for NYSE listed stocks. After calculating correlation and cointegration between many of the shares traded on the NYSE, we created this list for further investigation. The list is sorted based on current spread, however the spread between each stock pair is significant. Please note that just because two stocks are mathematically cointegrated and have a statistically significant spread does not mean the spread will close. Thorough fundamental analysis is needed to assess the likelihood of the spread closing, and expected timing of such closure. For three pair picks which we believe are likely to close please see our future Quantessential Views piece. - the Fed will react to what happens and its ability to lower interest rates is limited, therefore QE is likely. We agree with Mr. Dalio. In fact, we believe that we may have crossed the pivotal turning point. Based on this belief, we see equities in the short term (<12 months) being supported by global central bank actions. It is not yet time to exit equities, but it is a good time to begin thinking of short and defensive positions, as well as playing volatility, which we believe will continue to increase in the short term. In the medium term (12 < time <= 24 months), we see high chances of a bear market and believe a net short equity strategy will be successful. In the long term (> 24 months), we believe economies will begin to stabilize and growth will come back. Debt per household has been on a steep incline since the ‘90s, and debt as a multiple of real median household income is at historic levels (Chart 1). Portions of this money have been invested into assets like stocks, bonds, and real estate, sending valuations to historical, or near historical, highs. This has created an illusion of security because household net worth has shot up. If assets were expected to provide increasing returns in the form of earnings, and inflation was expected to rise, then this situation would not be worth discussing. We will show this is not the case; the risks of deflation and lower asset returns outweigh the risks of inflation and above average returns. We believe the Fed sees this and is already reacting to it, as shown by the decision to delay raising rates in September. Despite record valuations, asset returns in the form of earnings are already below historical values. Chart 2 shows S&P 500 real earnings growth alongside the S&P PE ratio. It can be seen that while earnings growth is lackluster, the PE multiple remains high above its long term median level of 14.6 and has been so for the majority of the run-up in debt. 1) Much of the earnings growth experienced in the early 2000s, while beneficial to shareholders, came at the expense of employees through low or no pay increases and/or job cuts. America’s median real income peaked in the year 2000 and has been on a slow decline since. At same time household debt has been rising, pushing the cost of housing along with it. In short - consumers are tapped out. The labor force participation rate has also been in decline since 2000, including the categories of those aged 25 to 54, women, and the educated. The slack in the labor market does not incent employers to raise wages and cause consumers to spend, which would cause inflation. 3) After decades of high growth, China is slowing down. The Chinese slow down in a globalized world is having two major consequences: lower demand for western corporations services and technologies, and lower demand for commodities. While lower commodity prices are good for some industries, like manufacturing, the benefit of cheaper manufacturing costs comes at the expense of commodity related capital investments and rising inflation. Low inflation incents households to delay spending, lowering corporate earnings and economic growth prospects. We believe these three factors are shaping the near to medium term economic climate (<= 24 months), and pushing the global economy into a large deleveraging phase. Our proprietary global macro model is pointing to the economic shift already having crossed the pivotal turning point (Chart 3). Our model processes over 290,000 global economic variables, then uses a series of dimensionality reduction and feature extraction algorithms to display a 3D topography of the global economy. We have superimposed the S&P 500 in orange, and pointed out the dotcom bubble and the Great Recession. Our model has the recent peak in the global economy occurring in January 2015.